Dr. Katherine Schier uses advanced dental technology to improve your experience in the dentist’s chair. Whether you’re interested in a same-day crown or sedation dentistry, you can trust us to have what you need. Our Kalamazoo, MI dentist is always looking for the best technology to improve her dental practice. Click any of the links below to learn more about our latest dental technology. Our dentist in Kalamazoo, MI is dedicated to helping patients maintain healthy smiles. To request an appointment with Dr. Schier, call Kalamazoo Smiles at (269) 353-3700. Our panoramic x-ray machine rotates around your head to take a 360-degree view of your teeth, sinuses, and bone structure. Since panoramic x-rays are more comprehensive than standard dental x-rays, you won’t need them as often. Our dentist may take panoramic dental x-rays to diagnose oral health conditions or plan treatment. We also take panoramic x-rays every few years as part of your preventive care. Our dentist in Kalamazoo, MI uses digital dental x-rays to take highly precise images of your teeth. These images are then sent to our computer where we’re able to magnify and enhance your dental x-rays to better diagnose and treat conditions affecting your oral health. Unlike traditional film-based x-rays, digital x-rays expose you to far less radiation. This is just one of the many ways Dr. Schier looks out for her patients. The American Cancer Society estimates that about 53,000 Americans will get oral or throat cancer this year. Fortunately, Dr. Schier offers oral cancer screenings to catch this disease in its early stages. During your oral cancer screening, we feel the inside of your mouth for lumps and check for any abnormalities that could indicate malignant lesions. Dr. Schier uses an intraoral camera to take pictures of your teeth, gums, tongue, and the rest of your mouth. Unlike older dental technology, the intraoral camera has a slim design that allows our dentist to view the inside of your mouth from a wide range of angles. We’re able to digitally store, print, or delete the images captured by our intraoral camera. Our dentist uses a rotary endodontics-dentist handpiece during root canal therapy to gently and efficiently remove diseased dental pulp. Dental pulp is the living tissue inside your tooth. However, once a cavity is deep enough to breach the innermost layer of your tooth, you’ll need a root canal. Using the rotary endodontics-dentist handpiece allows us to streamline root canal therapy so you can spend less time in the dentist’s chair. Dr. Schier uses CEREC to plan and place a dental crown in one appointment. First, she’ll need to remove enough enamel from the tooth so the dental crown fits comfortably over top. Next, she’ll take digital impressions of your teeth. Using these impressions, our dentist will be able to create your CEREC crown right in front of your eyes using computer-aided design and manufacturing. We have a milling machine in our office that will precisely sculpt your dental crown from a block of ceramic. CEREC crowns look like natural tooth enamel and are strong enough to last for years. Oral conscious sedation is a stronger sedative than nitrous oxide, but you will still be responsive during your dental procedure. Oral conscious sedation will put you in a state of deep relaxation that still allows you to move or answer any questions our dentist might have during the procedure. Many patients who opt for oral conscious sedation have little to no memory of their dental procedure after the fact, which can be a relief for patients with dental anxiety. 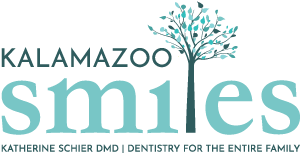 To request an appointment with our Kalamazoo, MI dentist, call Kalamazoo Smiles at (269) 353-3700.